Bile is a vital secretion, essential for intestinal digestion and absorption of lipids. Moreover, bile is an important route of elimination for environmental toxins, carcinogens, drugs, and their metabolites (xenobiotics). Bile is also the major route of excretion for endogenous compounds and metabolic products (endobiotics) such as cholesterol, bilirubin, and hormones.Bile secretion is an osmotic process driven predominantly by active excretion of organic solutes into the bile canaliculus, followed by passive inflow of water, electrolytes, and nonelectrolytes (e.g., glucose) from hepatocytes and across semipermeable tight junctions. The bile salt pool undergoes an enterohepatic circulation that is regulated by distinct bile salt transport proteins, including the canalicular bile salt export pump BSEP, the ileal Na+-dependent bile salt transporter ISBT (SLC10A2), and the hepatic sinusoidal Na+- taurocholate cotransporting polypeptide NTCP (SLC10A1). Other bile salt transporters include the organic anion transporting polypeptides OATPs (SLC21A) and the multidrug resistance-associated proteins 2 and 3 MRP2,3 (ABCC2,3). Bile salt transporters are also present in cholangiocytes, the renal proximal tubule, and the placenta. Expression of these transport proteins is regulated by both transcriptional and posttranscriptional events, with the former involving nuclear hormone receptors where bile salts function as specific ligands. Mutations of hepatocellular transport systems can cause congenital cholestasis. Examples include different forms of progressive familial intrahepatic cholestasis (PFIC1-3,) benign recurrent intrahepatic cholestasis (BRIC), and subtypes of intrahepatic cholestasis of pregnancy. Moreover, mutations of the phospholipid export pump (MDR3) may also manifest as cholesterol gallstone disease. -In humans, mutations in MRP2 produce the Dubin-Johnson syndrome, a cause of hereditary conjugated hyperbilirubinemia. Gallstones are small, pebble-like substances that develop in the gallbladder. The gallbladder is a small, pear-shaped sac located below your liver in the right upper abdomen. Gallstones form when liquid stored in the gallbladder hardens into pieces of stone-like material. The liquid—called bile—helps the body digest fats. Bile is made in the liver, then stored in the gallbladder until the body needs it. The gallbladder contracts and pushes the bile into a tube—called the common bile duct—that carries it to the small intestine, where it helps with digestion. Bile contains water, cholesterol, fats, bile salts, proteins, and bilirubin—a waste product. Bile salts break up fat, and bilirubin gives bile and stool a yellowish-brown color. If the liquid bile contains too much cholesterol, bile salts, or bilirubin, it can harden into gallstones. The two types of gallstones are cholesterol stones and pigment stones. Cholesterol stones are usually yellow-green and are made primarily of hardened cholesterol. They account for about 80 percent of gallstones. Pigment stones are small, dark stones made of bilirubin. Gallstones can be as small as a grain of sand or as large as a golf ball. The gallbladder can develop just one large stone, hundreds of tiny stones, or a combination of the two. Illustration of the biliary system, showing the liver, gallbladder, pancreas, and the duodenum with the appendant ducts. Bile trapped in these ducts can cause inflammation in the gallbladder, the ducts, or in rare cases, the liver. Other ducts open into the common bile duct, including the pancreatic duct, which carries digestive enzymes out of the pancreas. Sometimes gallstones passing through the common bile duct provoke inflammation in the pancreas—called gallstone pancreatitis—an extremely painful and potentially dangerous condition. If any of the bile ducts remain blocked for a significant period of time, severe damage or infection can occur in the gallbladder, liver, or pancreas. Left untreated, the condition can be fatal. Warning signs of a serious problem are fever, jaundice, and persistent pain. Cholesterol is not very soluble, so in order to remain suspended in fluid it must be transported within clusters of bile salts called micelles. If there is an imbalance between these bile salts and cholesterol, then the bile fluid turns to sludge. This thickened fluid consists of a mucus gel containing cholesterol and calcium bilirubinate. If the imbalance worsens, cholesterol crystals form (a condition called supersaturation), which can eventually form gallstones. The liver secretes too much cholesterol into the bile. The gallbladder may not be able to empty normally, so bile becomes stagnant. The cells lining the gallbladder may not be able to efficiently absorb cholesterol and fat from bile. There are high levels of bilirubin. Bilirubin is a substance normally formed by the breakdown of hemoglobin in the blood. It is removed from the body in bile. Some experts believe bilirubin may play an important role in the formation of cholesterol gallstones. Pigment stones are composed of calcium bilirubinate, or calcified bilirubin. Pigment stones can be black or brown. 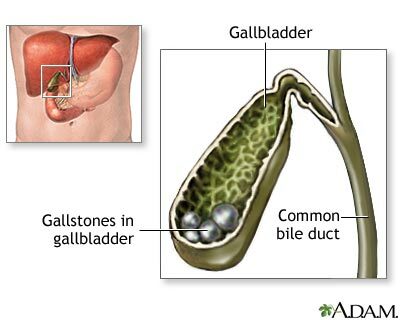 Black stones form in the gallbladder and are the more common type. They represent 20% of all gallstones in the U.S. They are more likely to develop in people with hemolytic anemia (a relatively rare anemia in which red blood cells are destroyed) or cirrhosis (scarred liver). Brown pigment stones are more common in Asian populations. They contain more cholesterol and calcium than black pigment stones and are more likely to occur in the bile ducts. Infection plays a role in the development of these stones. Laboratory examinations revealed that the bile of patients with calcium birirubinate stones had almost invariably been infected with Escherichia coli. Bilirubin glucuronide is know to undergo hydrolysis into free bilirubin and glucuronic acid in the presence of the enzyme Beta-Glucuronidase. The activity of Beta-glucuronidase in bile was studied primarily in a variety of biliary disorders. Normal Bile was always free of Beta-glucoronidase activity, whereas bile infected with E.Coli, especially specimens obtained from patients with calcium bilirubinate stones, exhibited intense activity of this enzyme.